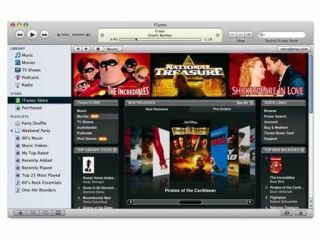 Top Hollywood studios are pressuring Apple to change the way its iTunes software operates to pave the way for the companies to add their movies to its online store. According to reports from the US, 20th Century Fox , Universal , Paramount and Warner Bros want to be sure their films aren't illegally copied between iPod owners. They're worried that because iTunes can accept multiple iPods on one PC, it will be all too easy for users to make multiple copies for friends, which will eat heavily into Hollywood's profits. Apple declined to discuss the matter, saying the company never comments on issues that aren't finalised. Negotiations are ongoing, so it may be some time before we learn about any changes to iTunes' distribution controls. This comes after the US Library of Congress passed a blanket ban on members of the public copying their DVDs to devices such as iPod.